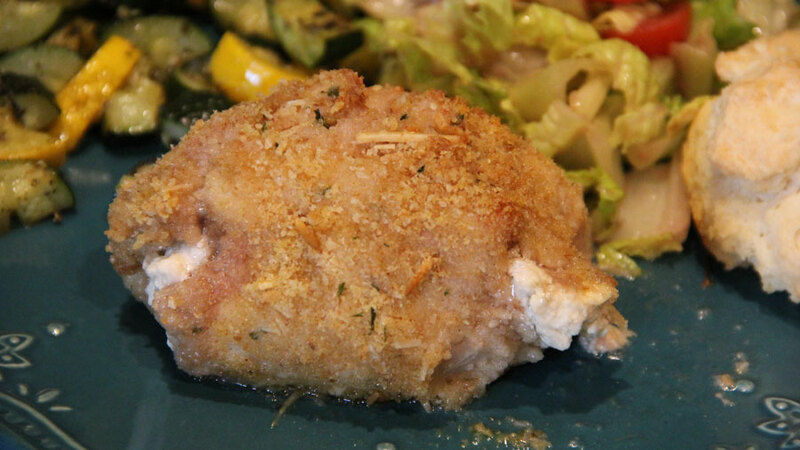 Watch how to make Belle’s Bacon, Spinach, and Blue Cheese Stuffed Chicken in the video above! My bacon, spinach, and blue cheese stuffed chicken not only tastes amazing, it also looks amazing, making it a perfect dish for those special occasion meals. However, it’s so simple to make, I usually prepare it much more often. It can also be put together in advance and then simply put in the oven for thirty minutes right before dinner. The chicken is tender and juicy and the stuffing is flavorful with a bit of tanginess. It may look and taste like it took a lot of effort, but only you need to know how easy it really is. In a bowl, mix together the spinach, blue cheese, and bacon bits. Place about 2 tablespoons in the center of each chicken piece and wrap them up and secure with toothpicks. Stir together the flour, salt and pepper on a dinner plate. Roll the chicken in the flour to coat. Heat the oil in a skillet over medium-high heat. Brown each piece of chicken in the oil and then place in a lightly greased baking dish, and cover with foil. Bake for 30 minutes at 350 degrees, until chicken is done and no pink remains.